Background: Cytosolic Phospholipase A2 (cPLA2), an important isoform of PLA2 that mediates the release of arachidonic acid, plays a role in the pathogenesis of Spinal Cord Injury (SCI). The expression and activation of Cpla2 are significantly higher in SCI, leading to neuronal death in spinal cord tissue. Novel strategies are needed to substantially reverse the effect of cPLA2 activation; one such strategy is inhibiting cPLA2 by jamming its lipid binding C2 domain. Objective: To develop a much needed strategy to treat SCI, we used a Computer Aided Drug Design (CADD) method to discover novel cPLA2 inhibitors. Methods: we used a natural chemiome database for virtual screening, from which we selected the compounds exhibiting the greatest drug-likeliness properties for molecular docking simulation analysis. Results: We studied the interaction of lead compounds at the atomic level; the results yielded a cPLA2 inhibitor of natural origin with the potential for ameliorating secondary tissue damage and promoting recovery of function after SCI. The top compound, lead 4exibited a binding energy of -10.02 Kcal/mol and formed three hydrogen bonds with the lipid binding C2 domain of the cPLA2 protein. 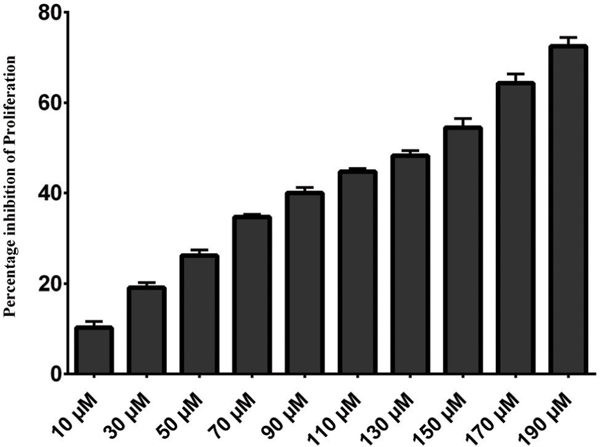 An evaluation of cell cytotoxicity revealed an IC50 for lead4 of 134.2 ± 6.8 µM. An in-vitro analysis of lead4 is indicated anti-apoptotic activity via a decrease in caspase-3 expression. Conclusion: We used the CADD method to make a novel lead discovery for the treatment of SCI using compounds of natural origin. The selected natural compounds are non-toxic promising drugs against cPLA2 protein, allowing us to limits our focus on single compound for future in-vitro and invivo testing. Keywords: Spinal cord injury, secondary SCI inhibition, drug discovery, natural compounds, cPLA2, virtual screening, molecular docking simulation. Keywords:Spinal cord injury, secondary SCI inhibition, drug discovery, natural compounds, cPLA2, virtual screening, molecular docking simulation. Abstract:Background: Cytosolic Phospholipase A2 (cPLA2), an important isoform of PLA2 that mediates the release of arachidonic acid, plays a role in the pathogenesis of Spinal Cord Injury (SCI). The expression and activation of Cpla2 are significantly higher in SCI, leading to neuronal death in spinal cord tissue. Novel strategies are needed to substantially reverse the effect of cPLA2 activation; one such strategy is inhibiting cPLA2 by jamming its lipid binding C2 domain. Neuropathic Pain: Is the End of Suffering Starting in the Gene Therapy?